Luxe eigendom. Private verwarmd zwembad, poolhouse & terrein. Medieval Mirepoix (Nr Carcassonne) - Perfecte locatie Peaceful Yet Not Remote. Mountain View Walks. Topkwaliteit accommodatie. Domaine de Pouroutounat is gebouwd in 1826 uit zachte zandsteen en biedt een ruime combinatie van de hoofdboerderij en de aangrenzende luxe omgebouwde schuur. Het aanbieden van accommodatie van topkwaliteit in 9 prachtige slaapkamers, 6 elegante bad of douche kamers (3 en-suite) met veel leefruimte om te ontspannen. Benaderd door een met bomen omzoomde oprit en gelegen op bijna 5 hectare privébos. Ideaal gelegen aan de Aude / Ariège grens, in de buurt van het middeleeuwse stadje Mirepoix met alle faciliteiten, markt, bioscoop, restaurants, bars en autovrij houten centrale plein. Landelijk maar NIET op afstand. Slechts 30 minuten van het werelderfgoed cite van Carcassonne. Volledig uitgerust om een ​​zeer hoge standaard en perfect voor familiebijeenkomsten, reünies, speciale gelegenheden of gewoon bederven jezelf! 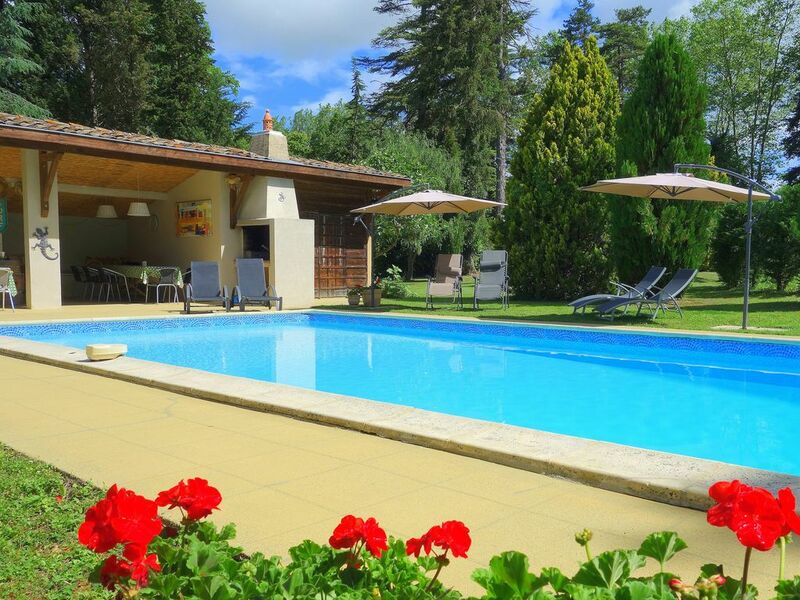 Geniet van de beste van Frankrijk in deze goed uitgeruste, ruime woning met Hotel-sized verwarmd zwembad. Grote poolhouse, zwembad dineren, koelkasten en BBQ. Smaakvol gerenoveerd met behoud van oude balken, stenen muren en terra cotta vloeren. Stijlvol ingericht, fris professioneel witgewassen beddengoed en kwaliteit handdoeken. Gratis wifi. Tal van grote lokale restaurants maar als je dol op koken is er een grote boerderij keuken met fornuis, kookboeken, kruiden en specerijen om je te inspireren voor het maken van Masterchef specials met verse producten van onze lokale markten. Gemakkelijk toegankelijk is voor luchthavens (Toulouse, Carcassonne, Perpignan), snelwegen en Middellandse Zeekust. ~ 9 ruime slaapkamers (14-25m2). Alle ruim en luchtig, goed ingericht met comfortabele matrassen, kwaliteit beddengoed en kussens. Fans voor alle kamers. ~ Twee keukens (hoofd- en secundair), beide volledig uitgerust met fornuis, koelkast-diepvriezers, vaatwassers, magnetrons en Nespresso-koffiemachines. Aparte bijkeuken met wasmachines en droogruimtes. ~ Eethoeken voor maximaal 16 gasten binnen en undercover. ~ Open gezellige gezellige woon / eetkamers met een gezellige open haard of houtkachel, Sony-tv's, iPod-docks en comfortabele stoelen voor alle gasten. ~ Serre, ideaal om te ontspannen, lezen, cocktails te drinken of gewoon naar het park te kijken. ~ Uitzicht op de bergen loopt direct voor de deur - geen buren! ~ Zwembad met groot overdekt poolhouse. Shady dineren, 2 koelkasten, BBQ. Verlichting om 's avonds te zwemmen. ~ 3 hectare grond zodat iedereen zich kan vermaken of een privéplek in de tuin in het aangrenzende natuurpark kan vinden. ~ Slechts 3 km (2 mijl) van het centrum van de middeleeuwse Mirepoix met alle faciliteiten, markt, bioscoop, restaurants, bars en festivals. ~ Auberge op 10 minuten loopafstand. ~ Kinderbedjes en kinderstoelen zijn gratis beschikbaar. Locatie is in het hart van het Land van de Katharen. In de buurt van Carcassonne, 1 uur van de Middellandse Zee, Toulouse en Andorra. In de buurt van het Canal du Midi. Op het parcours van de Tour de France (doorgeven op 12 juli van dit jaar!). Genoeg te zien en te doen voor alle belangen. Motorcycle & fietsenstalling beschikbaar. Off-road parking voor alle gasten. Speeltuin voor de kinderen op het terrein. En-suite met massagedouche en diep bad naar kingsize slaapkamer. Twee verdere doucheruimtes met badkamer in de boerderij. 1 grote inloopdouche, 1 complete badkamer met bidet, bad en douche, 1 doucheruimte met wastafel. Plus 3 afzonderlijke w. c.s een op de begane grond. Kitchen very good. Bedrooms clean and comfortable but shortage of bathrooms and en-suites. Good swimming pool. Mirapoix lovely. Thank you for this good review. We have 6 bathrooms for 9 bedrooms (of which two are single rooms). There are 3 en-suite bathrooms as well as 3 further bathrooms and 2 more separate w.c.s. This is usually fine for most groups but does entail some sharing if a particularly large group such as this one (16 guests). All the bathrooms are clean and well appointed and there is a plentiful supply of hot water. Wonderful house with great pool and outside space. We have just spent a week with 9 adults and 7 kids ranging from 1 to 10 yrs old and everyone had an amazing time. The accommodation itself is beautiful with a lovely little separate three bedroom house that worked well for the families with babies to be separate for peace and quiet for all! The main house has a nice downstairs area with big kitchen and living area with a conservatory seating area at the back, lovely comfy sofas and chairs and perfect for relaxing in an evening. The kitchen has a big cooker/oven and is one of the best stocked kitchens I have had the pleasure of using, loads of dishes and plates and even spices and herbs left for cooking with. There is also a large terrace off the kitchen where we spent most of our evenings as it was handy for both the houses and thats where you get signal from the baby monitors from the property next door! All the bedrooms are large and well furnished and have fans and shutters on the windows. The garden area is to the rear of the property and plenty of room for all the kids to run around, there is a football goal which brought hours of fun for the kids and adults. The pool area is again top notch and the pool was lovely and warm, plenty of seats and sunbeds and a great covered area with a large table for having those lunches by the pool. There are also two fridges by the pool area to keep water and beers cool for those hot afternoons. The nearest supermarket and petrol station is only 5 minutes away in Mirepoix and the supermarket has everything you could need, it is a large one that has great meat, fish, fruit and veg and of course local cheap wine! Mirepoix itself is an old town that reminded my son of the Tudors with the old wooden buildings and exposed beams, highly recommend parking up and having a wander around. There are plenty of restaurant serving good food, coffee and crepes and the parking is free all around the town. The owners were also a delight and always on hand for any help or advice, they live in the property next door but you would never know they were there. Overall, I would highly recommend staying here if you want a lovely pool and gardens near to a good town with a nicely furnished and comfortable house. Julie was great at communicating and responding to emails and answered any questions we had...thank you from all of us! Even better than expected, trust the reviews and book it! This property not just met our expectations, it exceeded them. The communication prior to, and during our stay from the hosts could not have been better. Very, very friendly and efficient. The location is wonderful, with so many places to see and visit, we needed at least another week. The beds are very comfortable, the rooms spacious and well equipped,(our son is a chef and thought the kitchen worked well) and the entire place is well decorated and very clean. In summary, don't hesitate, trust this and previous reviews, and book it! Our party of 16, aged from 78 to 2 years recently spent a most pleasant week in Domaine de Pouroutounat near Mirepoix. The property is very spacious and well furnished. The fact that there are two separate properties suited us as the family with small children had their own space. Large gardens and the heated pool were a bonus. Everything both indoor and outdoor was maintained up to a high standard..There were plenty of outdoor places to barbecue and tables with enough space for everyone to sit together.. Our hosts, Pete and Julie were most helpful to us. I would thoroughly recommend this place for any group to get together. Lovely to see a multi generation get together and so glad all the facilities were well liked. Just to add that the Farmhouse & Grange are adjacent, however there is plenty of shared space including a large table for up to 16 in both the front of the property and at the pool-house as well as separate facilities within each part of the property. Ideal for sharing and for privacy when needed. All eleven of us fitted easily and harmoniously into the accommodation and spent most of our day around the lovely pool. The house was easy to manage and well-equipped. There were many things to do in the surrounding area - sightseeing, canoeing, walking, visits to the lake and the local markets. But the high spot was the pool in which the children played for most of the day. As a group of 12 friends reuniting from various corners of the globe, we stayed at the farmhouse for a week and would all happily return in the future. The house exceeded all expectations; large spacious rooms, great socialising areas and an amazing pool / outdoor BBQ area. Both Julie and Pete were excellent hosts – very approachable and full of helpful advice. The surrounding area does not disappoint. The local town of Mirepoix is a quiet gem and the nearby lakes are breath-taking. 1 uur naar Narbonne Plage (lang zandstrand met goed resort), 20 minuten naar Lac Montbel met prachtig aangelegd strand, picknickplaatsen, verhuur van boten en waterfietsen, paardrijden, fietsverhuur. Autohuur essentieel. Carcassonne luchthaven op slechts 30 minuten. Toulouse 1 uur. Perpignan en Beziers 1. 5 uur. Reistijd ca. 12 uur vanuit Calais. Een gebied van uitzonderlijke natuurlijke schoonheid met een achtergrond van de Pyreneeën. Omringd door beboste heuvels en zonnebloemvelden. De lokale stad Mirepoix is ​​een volledig onderhouden stad met banken, twee supermarkten, twee keer per week markt en bijna 30 restaurants / cafés / bars. Veel festivals en een nuttig VVV-kantoor.